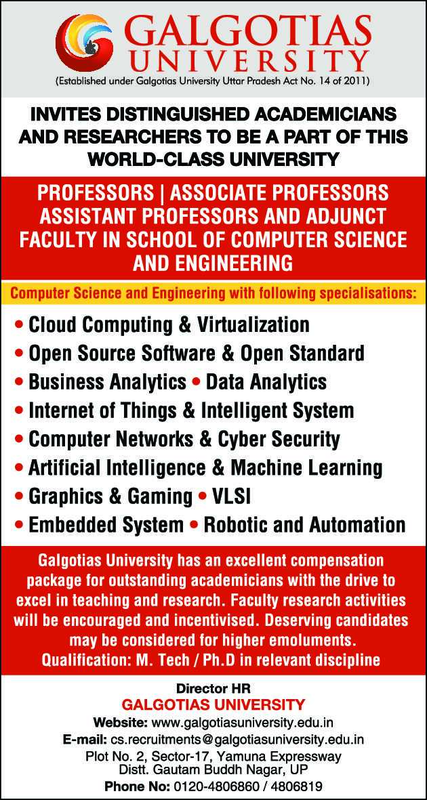 Galgotias University, Gautam Buddh Nagar has advertised in THE HINDU newspaper for the recruitment of Professor / Associate Professor / Assistant Professor /Adjunct Faculty jobs vacancies. Interested and eligible job aspirants are requested to apply as soon as possible from 17th April 2019. Check out further more details below. How to Apply: Interested and eligible candidates are requested to send applications along with CV, copies of certificates / mark sheets and recent PP size photos to the following email address or postal address.